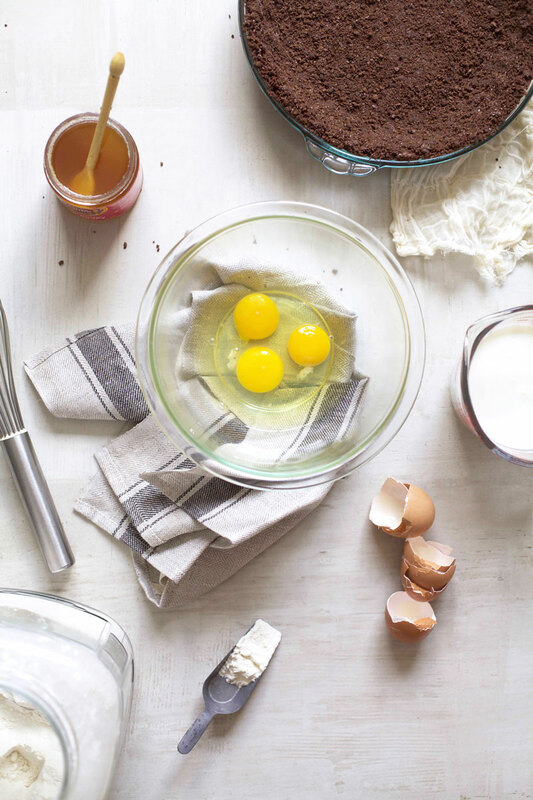 Happy pie-day! That’s a thing, right? I mean, who decided to call the day after Monday “Tuesday” anyways?? Because personally, I like pie-day a whole lot better! Pies are a big deal in my family. With several relatives that can make incredible pie crust in their sleep, it goes without saying that pies are our family’s dessert of choice. To put it simply, if our family had a mascot, it would be a pie. Since my Grandfather grew a lot of berries, we mostly had fruit pies growing up, with the occasional cream pie thrown in for good measure. However, when my family moved to the Midwest, we were introduced to something called “Buttermilk Pie”. At the ripe old age of 11, buttermilk in my pie wasn’t exactly peeking my interests. But I tried it, and, much to my surprise, I liked it. The creamy flavor resembled one of my favorite desserts, cheesecake, but with a slightly more tart bite to it. It quickly became a favorite. Of course, anyone that knows me, knows I can’t just leave well enough alone. Case in point, the buttermilk pie. While it’s plenty good enough as is, I thought, why not make it better?! So I switched out the regular pie crust for a chocolate cookie crumb crust and I made the filling with mostly honey (Bonus points for using Heavenly Organics Honey!) instead of all sugar. Heavenly Organics has three types of honey: neem, acacia and white. I used all three in some form of this dessert, because, three is obviously better than one. Of course, you don’t need to use every kind, you could easily use just one, but why limit yourself when they’re all so good?! No, really. Not only do they taste good, they’re also good for you. They’re 100% organic and raw, and they’re sourced using smoke-free, bee-protecting methods from naturally occurring beehives found in the wild in India and parts of the Himalayan Mountains. Guys, it legit doesn’t not getting any cleaner or more organic than that! And trust me, you can tell the difference in the flavor, color, texture and smell. It’s truly incredible (I may or may not have eaten a few spoonfuls plain…oops!). All of this natural, clean flavor comes through in cooking, making your dishes tastes even more magical than they would otherwise. Hence, why I used the honey to make this pie. To finish off the pie, I topped it with some honey sweetened whipped cream, sea salt flakes and honeycomb. The crust is thick and crunchy on the edges, but inside, it melts into the filling as it bakes to create a fudgy bottom layer with a cheesecake-like topping. Have I mentioned that it’s magical? Because, truly, it is! After all, I know what I’m talking about after all the pie I’ve eaten in my lifetime. Seriously this black bottom salted honey buttermilk pie it’s all the right notes. It’s sweet, salty, creamy, crunchy. It’s decadent, it’s dreamy, it’s delicious. Honey, I think I’m in love! In a medium-sized bowl, stir together the butter, sugar and cookie crumbs. Press firmly and evenly into the bottom and sides of a 9-9 ½” pie pan. Bake for 7 minutes, then remove from the oven and set aside to cool. Turn the oven up to 425 degrees, then proceed to make your filling. 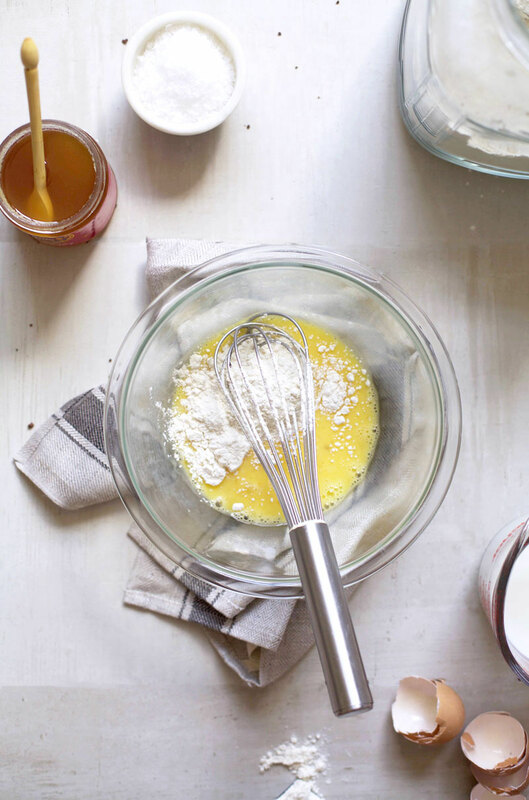 In a large bowl, whisk together the eggs, flour, salt, vanilla, sugar and honey. Continue whisking while slowly, but steadily, pouring in the melted butter and the buttermilk. Stir until no flour lumps remain and the mixture is slightly frothy. Pour into the crust. Bake for 15 minutes. Then, turn the oven down to 325 degrees. Cover the pie loosely with foil and continue baking for 40 minutes. Remove the foil, then bake for another 5-10 minutes, or until the top has turned golden brown and the pie is set. Remove from the oven and allow to cool for at least 3-4 hours before serving (you can also place it in the fridge to speed up the cooling times). While the pie is baking or cooling, whip the cream with the honey until soft peaks form. Store it in the fridge until you’re ready to serve the pie. 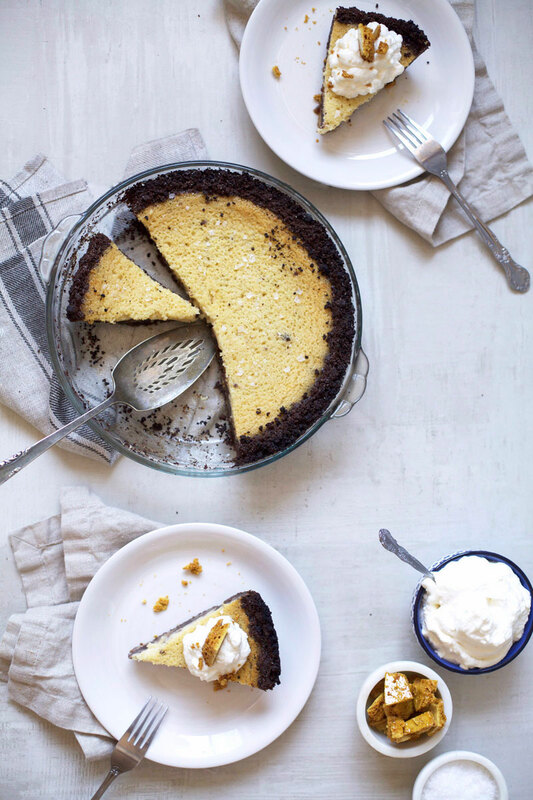 To serve, top the pie with some sea salt flakes, honeycomb pieces and a dollop of whipped cream. To store the pie, cover it with plastic wrap and keep it in the refrigerator. The longer this pie sits, the better (in my opinion). 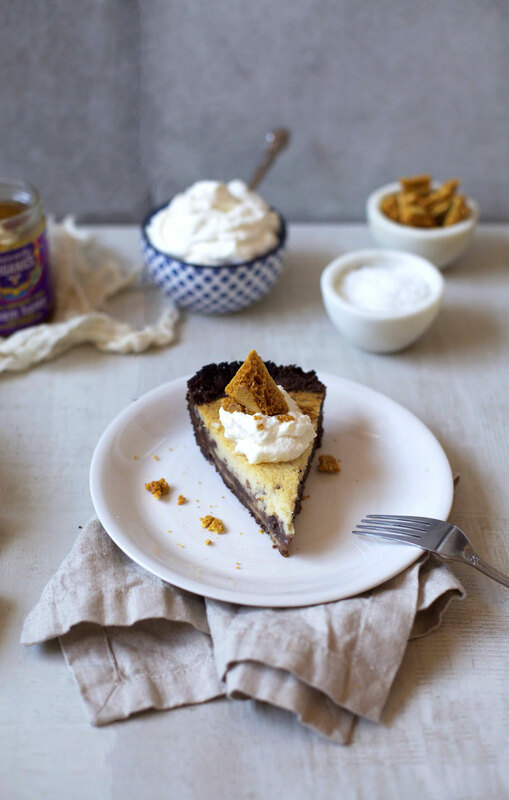 One night in the refrigerator and the pie’s flavors become a creamy, almost cheesecake-like texture and flavor that are pretty delicious! For the filling I used a mix of Heavenly Organics Acacia Honey and White Honey. I made my own honeycomb, which I used the Neem Honey for, and for the whipped cream I used the White Honey. You can use any of the honeys, or a mix of any, that you choose, or even just one flavor for everything. Thank you to Heavenly Organics for partnering on today's post!